Could Fujitsu's ReRAM Replace Flash Storage? Today Fujitsu took the lid off ReRAM, a new form of non-volatile memory with low power consumption. Like flash, ReRAM can maintain data after power is lost, but Fujitsu's product adds one important element: speed. 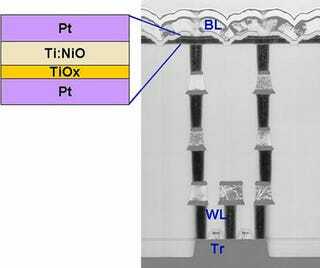 By wrapping titanium in nickel oxide, and by limiting the current flow from the transistor, the current needed to erase memory has been reduced to 100 micro-amperes or less. Plus, the whole operation can be completed in 5 nanoseconds. That represents a 10,000 fold improvement over previous attempts at ReRAM.